My best skate buddy is Alex. We started skateboarding at the same time, him with a Hook-Ups slick bottom and me with an Invisible Laban. While he haven’t skated together in years—due to living on opposite sides of the country—I have little doubt that he is still a much better skateboarder than I am, even if he rarely rolls these days. 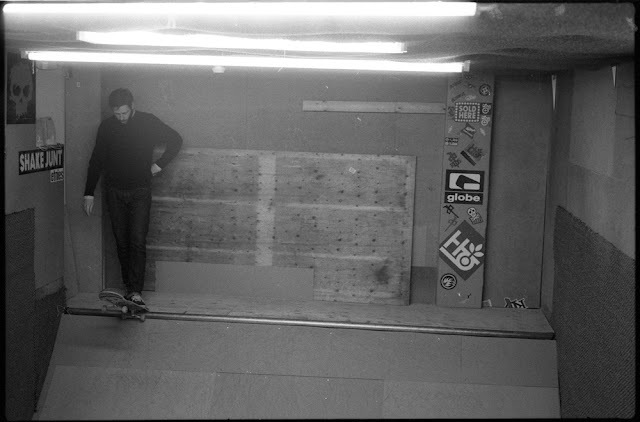 As kids, he was a goofy-footer that excelled at flatground, could poke his Danny Wainwright-styled Ollies higher and further than I, and was also unfortunately rather accident-prone. Alex’s neighbourhood was Marysville. At the time they had more dedicated skaters than my neighbourhood, Nashwaaksis. Actually, it’s possible that mine had the same amount, but I was less outgoing and lived in a slightly different part of Nashwaaksis than the other skaters I eventually got to know, so early on it was just easier to hang with Alex’s neighbours. Anyway, because of the amount of skateboarders in the area—which now that I’m reflecting on it was probably less than 10—and the fact they had a few friendly spots to skate with some boxes and ramps, I often went over to Alex’s house on Fridays after school to skate, stay the night at his house, and then catch a ride with his mom across the river the next day to skate and roam the downtown core of our city, all six or so blocks of it. As I mentioned though, Alex was rather accident-prone. One Friday afternoon, not long after we became skateboarders, we did something many newcomers do: we set some benches up going off the back porch and into the grass. We had the benches set up so we could roll right onto them. Now I’m not exactly sure what our best intentions were, as I would wager that at this point we could barely Ollie. So it may have just been young teenagers playing skateboard-Hot Wheels and trying to build a track. Regardless of our end goal, we didn’t get there, nor did we make it downtown the following day. On an early test ride, Alex’s wheels caught in a gap between the benches, propelling him towards the end corner of the bench, which proceeded to lacerate his stomach. I don’t recall this wound actually requiring stitches, but it was enough to lay him up for the weekend. A visit to Marysville a while later on a Friday afternoon brought a similar outcome. Some friends had just finished building what we all used to call a “crusher”; a term I’ve not heard elsewhere that really just refers to a tall box. I don’t know the origins of its menacing name, but it turns out that a more apt name might have been slicer, since one of Alex’s first attempts to break in the box via a 50-50 resulted in him coming up short and slicing his shin damn near down to the bone. Again, my memories fog up after these climatic points, so I can’t recall if Alex needed stitches, but I can recall being disappointed that we’d be missing another Saturday of skating downtown. Another day, while skating in our friend James’ driveway and swimming in his pool, Alex’s foot slipped off his tail while ollieing over two decks pro stacked and he proceeded to “Watson” as we called it, doing the splits with one foot on and one foot off the board, which put his leg in an air cast for a lengthy amount of time afterwards. Finally, while we were skating outside of a church in Marysville that let us set up a few boxes, yet another weekend of skating was ruined in a strange way. I should say here that one of Alex’s many nicknames was “Loaf”, because he was always being verbally cut up. Now that I’m writing all this, I’m realizing that he was often being physically cut up too, so the nickname worked on a couple of levels. He’s a passionate guy that wears his heart on his sleeve and says what he thinks, which often brought him a hard time, but he always seemed to be a sport about it. So while we were skating, or likely after, while we were all just chatting, another friend named James somehow put Alex into a “Gracie Chokehold”. Now I believe this was far prior to UFC being a thing at all. I certainly didn’t know anything about it, but somehow James did, and he had perfected this move, or maybe he was perfecting it right then on poor Loaf. I think the move was less focused on the choking but more on back torquing, which, as you may have guessed, effectively cancelled our usual Saturday plans. In closing, I will say that Alex was the one who drove me to the hospital when I nearly broke my ankle skating flatground in later years, so he’s not the only accident-prone one. Although it’s been years since we have rolled together, if I could pick anyone to skate with today, it would be him. Although he would probably stipulate that we not skate in Marysville on a Friday afternoon.